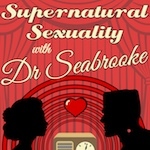 I wrote four scripts for the first season of the monster romance podcast Supernatural Sexuality with Dr Seabrooke. I did quality assurance on the English-language release of the illustrated light novel Battle Divas: The Incorruptible Battle Blossom Princess and its sequel, Battle Divas: The Unshakable Winter Blossom Princess. I was the proofreader for the English-language release of the illustrated light novel Yume Nikki: I Am Not in Your Dream. All of the Paradox Space comics featured below, along with a print-only story exclusive to the second collection entitled Fiduspawn, can be found in Paradox Space Volume 1 and Volume 2. 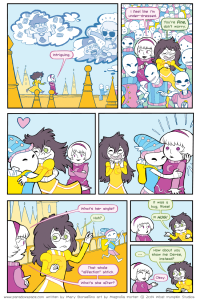 A five-page story for the What Pumpkin webcomic Paradox Space, script by me and art by J.N. Wiedle. A two-page story for the What Pumpkin webcomic Paradox Space, script by me and art by Rennie Kingsley. A seven-page story for the What Pumpkin webcomic Paradox Space, script by me and art by Allison Shabet & Tom Siddell. 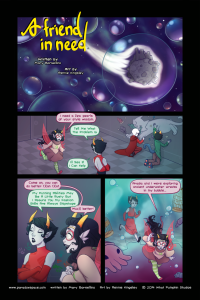 A four-page story for the What Pumpkin webcomic Paradox Space, script by me and art by Magnolia Porter. snicker/snack, described as Fall Out Boy drummer Andy Hurley as “aweosme”, had pictures by Audrey Fox and words by me. It appeared in the collection Girls Drawn Wild! 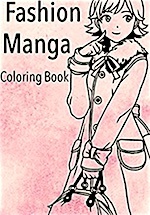 Full of twin tails, sports stars, fashion plates, and all the charm that manga and anime can embody, this coloring book contains 24 stylish illustrations ready for decoration. Order now at Amazon for $4.99.